The modern world we live in is moving fast with new technologies and innovations in all the fields. However, its impact have made it inevitable for us to think about clean energy and technology. While impressive progress has been made in the field of clean technology in recent years, the success stories in this field haven’t made a huge difference in the market. This makes it even more important for us to strive for success in clean technology and encourage people to take up the challenge of making clean technology a huge success. Thus, came the first edition of India Cleantech Challenge 2016. 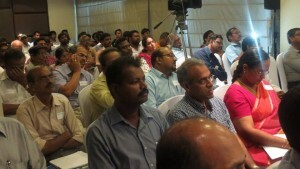 The first edition of India Cleantech Challenge 2016 was hosted by Chennai edition of TiE, in partnership with Cleancubator , Founder Institute and Aspiration Energy. The purpose of this event was to promote among people the need for innovation and new technology in Clean Technology sector. How the shortlisting was done? At what stage are they into the idea? Have they made a prototype? What current problem is the idea tackling? How feasible is the idea? The 15 selected applications were further scrutinized by interacting with the applicant and brought down to final 5. How the mentoring was done? Between the three of them, they have over 45 years of experience in the clean technology sector. Over a period of 10 days, the 5 finalist were mentored by the mentors on their business plan, market value of the idea, feasibility, marketing strategy and technical strategy. The pitches of the participants were judged by 5 judges. Among the judges were Mr.Raghuram.C, President & CEO of E-Hands Energy Ltd., Mr.Ramesh, Senior Deputy Editor of Business Line. Also among the judging panel were the three mentors. Solution Capability – How well does it satisfy the stated pain point and how is it different from the existing solution? Team – How diverse is the team? Commercialization – How close is the solution to commercialization? Go to Market Plan – Does the contestant have a clear plan to hit the market? First edition of India Cleantech Challenge took place on the 21st April 2016 at Hotel Hilton. In the morning prior to the event, each of the applicants had a final session of mentorship by the mentors. This session was followed by the actual event which started at 4:00PM. Following the registration between 3:30 and 4:00 PM, Mr. Bhoovarahan gave the opening speech to the guests and participants. Opening speech was followed by short talks by Mr.Gopi and Mr.Narashimhan emphasizing about the need for innovation in clean technology. Both of them also spoke about their respective organization – The Founder Institute and Cleancubator. The pitching session started at 4:30. Each of the participants were given 10 minutes to pitch their idea to the judges and audience. At the end of 10 minutes irrespective of if they have finished their pitch, the contestants were asked to stop. At the end of each pitch, judges asked a bunch of questions to the contestant on their business plan, idea, go-to-market strategy etc. Pitching session went on till 5:45, post which the audience were allowed to ask questions to the participants. 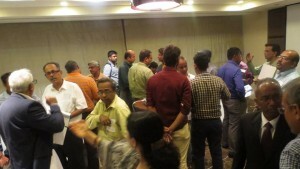 Total of 106 people attended the event, which comprised of people from diverse set of group like industry personnel, people from clean technology sector, members of media, college student and many entrepreneurs from various sectors. Pin drop silence during the pitching session, along with a furry of questions being shot at the contestants during the audience interactions gave a glimpse as to how informative and engrossing the pitching session was. At the end of audience interactions, results were announced. Judges had a tough time selecting the winner and runner up. The privilege of announcing the result was given to Mr.Ramesh. “Today, was not a competition. It was a knowledge sharing session. There are no losers today, but we have 5 winners today”, said Mr.Ramesh. However for the sake of the competition, the results had to be announced. 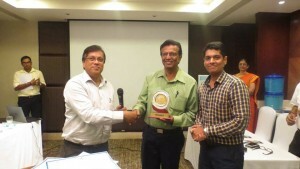 Mr.Mahesh of Zero Energy Cooling & Lighting was awarded as the winner. He had pitched about his product named SuN Shield, which helps prevent radiant heat from entering our houses by means of using aluminium foils. 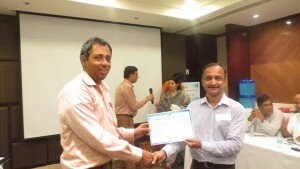 Mr.Chandrashekar of Watsan, was announced as the runner up for the event. He pitched about his electricity free and maintenance free water purifiers, which uses candles to remove the impurities and harmful substances like Iron, Flourine, Arsenic etc from the water. Lets not forget the other three participants who were no less than the winner and runner up in terms of their ideas. 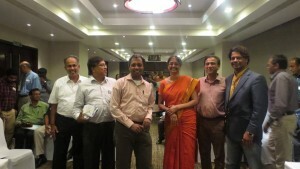 Mr.Jaswant Singh who has the idea of converting plastic waste to fuel oil, Mr.Chalasani Veerabadra Rao who is the inventor of Chalasani Turbines – a perpetual motion machine, and Mr.Karthic Narayanan who has designed Energy Box to produce Bio-gas and plans to bring down the fermentation time to 5 days. The eventful and knowledge sharing evening came to an end with a hope that Edition Two of India Cleantech Challenge would be coming soon…. Until India Cleantech Challenge 2.0 Go green and be green. 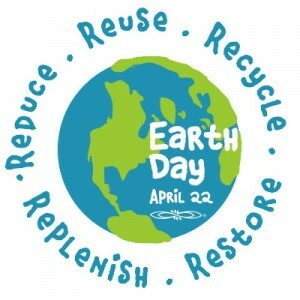 Strive to make our mother earth a greener and cleaner place to live in. It is indeed nice to say Hi to all cleantech enthusiasts. Soon, we will be interacting with some interesting startups in the country and starting our support programs for them. I and my team plan to use the Cleancubator blog to showcase some exciting startups emerging in the cleantech ecosystem, be they in India or elsewhere. And also plan to use this blog to interact with many of you who could be interested in cleantech in some way or the other.